The Varsity Quiz Program is patterned after a high school program that was being sponsored by the Kiwanis Club of Greater Anaheim. In 1969 a delegation from that club convinced the leadership of the Kiwanis Club of Las Vegas to sponsor a similar program in Clark County. The Southern California program, centered in Orange County, was called Kiwanis Bowl. The Southern Nevada program was named Varsity Quiz. It is conducted within the Clark County School District (CCSD). For nearly 30 years, the championship teams from Orange and Clark Counties met in a Bi-State Championship playing one year in California and the next in Nevada. That tradition ended when the program in California folded. The Varsity Quiz Program completed its 48th season in 2017. About 39 high schools in CCSD participate. Most games are played on school campuses. The championship series, including the All Star Game, are recorded at Vegas PBS TV-10 for broadcast on CCSD educational channels and Vegas PBS Channel 10. A Junior Varsity Quiz Program, started in 1987, provides academic competition for students in nearly 40 middle and Junior High Schools. These games are played in tournament style on a middle school campus followed by a championship match recorded at and broadcast by Vegas PBS. 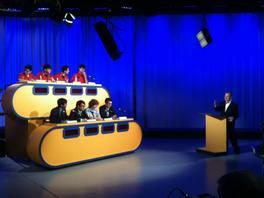 The Varsity Quiz Program is a partnership between the Kiwanis Club of Las Vegas, CCSD, and Vegas PBS TV-10. CCSD provides coaches, question writers, and moderators; Vegas PBS records and broadcasts championship playoff games; and the Kiwanis Club provides liaison, judges, scorekeepers, trophies, financial awards and a scholarship. Since 1986, a $1000.00 scholarship has been awarded to an outstanding Varsity Quiz graduating senior in the name of Harvey N. Dondero, a distinguished CCSD administrator. After 30 years, the fund has been retired. To preserve continuance of the award, Kiwanis Past President Howard W. Naylor has provided funds for awards to be presented in his name beginning with the 2016-2017 competition year. Over the life of the program, more that $100,000.00 in competition and scholarship funds have been awarded. The program is held in such high regard that the CCSD Board of Trustees has added Varsity Quiz to the CCSD Wall of Excellence displayed in its Board Room.